According to the Tax Policy Center (whose analysis does not include the health care changes in the bill), fully 61.8 percent of the total federal tax change under the bill will go to the top 1 percent in 2027, its 10th year of implementation. They would get an average tax cut of $32,510, and the top 0.1 percent (who make at least $5.1 million a year) would get $208,060 back on average. But within the 10-year window, the Joint Committee on Taxation has estimated the bill costs more than $1.4 trillion. That undercounts the likely real cost, if all the other provisions are actually extended, considerably. The Committee for a Responsible Federal Budget estimates that the true cost if everything is made permanent (as Republicans are promising) is $2.2 trillion over 10 years, and more after that. Now, maybe you think that the deficit is currently too low, because interest rates on federal debt remain pretty low, the economy isn’t growing particularly fast, and adding some grease to the wheels to get things moving a bit faster would be a good idea. But even in that case, it’s worth asking whether a $1.4 trillion to $2.2 trillion expansion of the federal debt for the purpose of lowering corporate tax rates is the best use of that money from an economic growth perspective, compared to expanding subsidies for parents to help them work and raise kids, or investing in infrastructure. Now Trump and the politicians, working together, are set to pass a tax plan that will lavish enormous benefits on people like Trump — and in key ways further rigs the system on their behalf. In a big speech yesterday about the plan, Trump declared that “this is going to cost me a fortune” and added: “I have some very wealthy friends” who are “not so happy with me.” But as Kessler’s fact-check shows, this is nonsense. Both GOP plans repeal the estate tax or make the exemption vastly larger (which would benefit Trump’s family after he shuffles off to account for his life to his maker). They repeal the Alternative Minimum Tax, which is designed to ensure that the rich pay at least something. They both give preferential treatment to “pass-through” income, the vast bulk of which goes to the top 1 percent, and Trump owns an untold number of pass-throughs. We don’t know precisely how the final plan would apply to him now, but this is because Trump has not released his tax returns (his argument is basically, “I’ll lose out bigly, believe me”). But based on 2005 Trump tax returns that have leaked, Kessler shows, under the plan Trump would have saved anywhere from $35 million to $42 million that year. I’ve been writing about American politics for a quarter century now, and I have read in considerable detail about every major tax bill that Congress has passed in probably the last 80 years. And I can tell you that nothing remotely like this has ever happened. In terms of both process and substance, it’s utterly without precedent. The process, I’ve written about before. To push through legislation like this with literally zero hearings in the House and one in the Senate, which took testimony from one witness, is a mockery of democracy. No one can defend this. It’s a disgrace. And as for the substance—well, it’s dreadful, and it’s tied to the process, of course, because a package of lies and giveaways like this could never survive a transparent legislative process. This bill goes far beyond what all past Republican tax bills have done. In the past, Republican plans took care to ensure that the middle class got a tax cut, too. The rich got far more of course, but as long as the middle class got something they could sell it as a middle-class tax cut. Now, even that thin pretense is dead. This will raise taxes on millions of middle-class people, as earners making $40,000 to $50,000 will by 2027 be paying $5.3 billion more while millionaires will pay $5.8 billion less. Republicans just no longer give a crap. They’re like the family alcoholic who used to at least try to hide it, sneak his nips in the attic, but now no longer even bothers trying to hide. To the outside world, it might seem bizarre that Ryan would tolerate the slow transformation of his party into authoritarianism and naked racism, only to rise up in righteous indignation over a defection on a tax bill that nonetheless passed easily. Ryan is a man of principle, and his principles are shared by many if not most members of his party’s elite. Their fixation with cutting taxes and their tolerance for the president’s abuses of power are both expressions of these principles. We need to understand these beliefs and what they imply. What are they telling us with these comments? They are revealing that there is something more than dollars and sense at stake. They believe a political system that allows the majority to vote themselves a raise by taxing a minority is a form of persecution. Liberals have had trouble grasping the willingness of conventional Republican politicians like Ryan to cooperate with Trump’s repeated violations of democratic norms. Why violate a core ideal like the sanctity of the republican form of government, they wonder, for a meager reward like tax cuts? From the standpoint of a Paul Ryan, however, he is not selling out. He is advancing his highest ideals of public service. The tax bill, protecting the makers from the predations of the takers, represents one of the great triumphs of freedom of his adult life. Today he largely eviscerated his own message and plea for Senate comity when he announced that he’d support a partisan tax bill that is every bit as contemptuous of regular order as was the health-care bill. He said in a statement: “I believe this legislation, though far from perfect, would enhance American competitiveness, boost the economy, and provide long overdue tax relief for middle-class families.” Of course, he could have demanded a better, bipartisan bill produced through regular order — and kept his reputation as a man above partisan politics intact. Republicans see it as a winning move. The individual mandate is very unpopular. And repealing it will save more than $300 billion — which can pay for big tax cuts for corporations and the very wealthy. The best economic evidence we have shows that if the individual mandate disappears, premiums go up and millions of Americans lose coverage. The Congressional Budget Office pegs the decline in the number of insured at 13 million. It is pretty remarkable that Republicans were apoplectic about debt when our economy was in freefall in '08 and '09, and yet hardly anyone blinks over a trillion tax cut when our economy is at 3.3% growth and our unemployment rate is 4.1%. Seriously, this is just horrible, horrible policy. Unless, as Chait so aptly points out, your overarching political value is making life easier for rich people. Even then, it’s short-sighted as they’ve got to live in a country with the rest of us. Ugh. Ugh. Ugh. 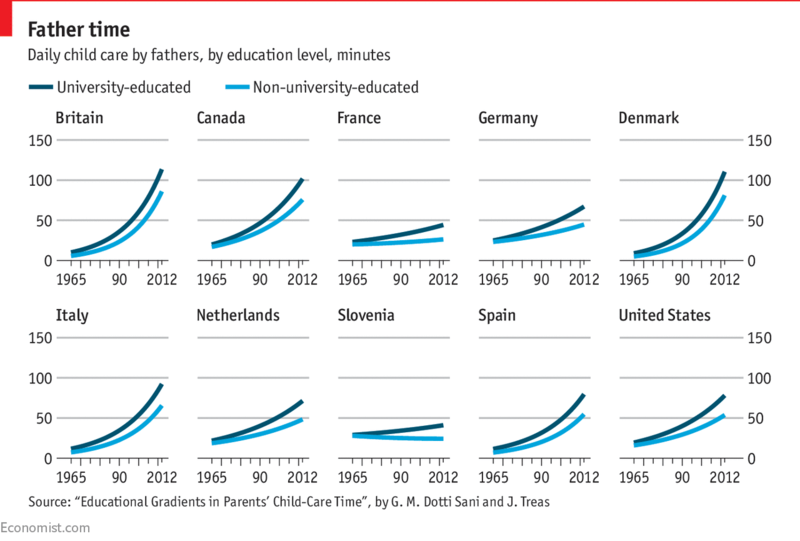 Among the many notable features is the the increasing gap by education in every country. 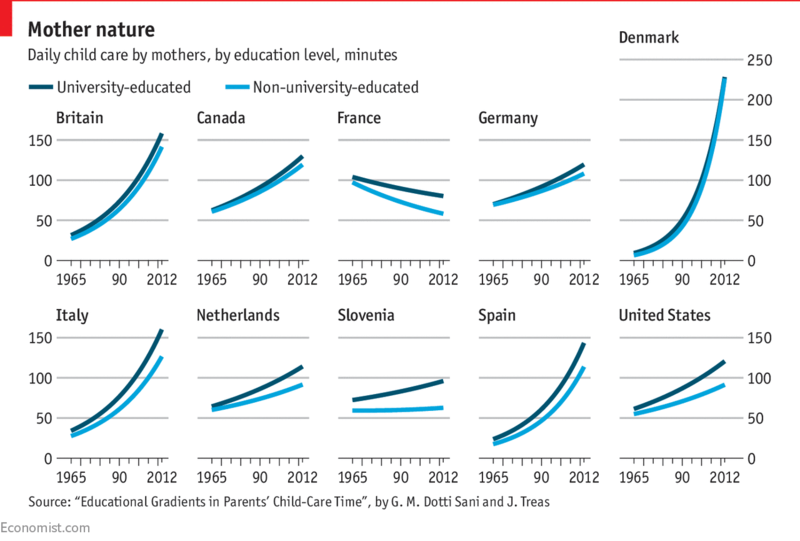 Quantity of parental time does not necessarily equal quality. Back in the 70’s and 80’s, my super-awesome mom just sent me out to play. Lots less of that today. That said, insofar as parental involvement helps kids (and this is presumably a rough metric of parental involvement), this suggests the rich (college-educated) getting richer. Also, what is up with Denmark?! The Republican tax bill hurtling through Congress is increasingly tilting the United States tax code to benefit wealthy Americans, as party leaders race to shore up wavering lawmakers who are requesting more help for high-earning business owners. On Monday, as Republican lawmakers returned to Washington determined to quickly pass their tax overhaul, senators were in feverish talks to resolve concerns that could bedevil the bill’s passage. With pressure increasing on Republicans to produce a legislative victory, lawmakers are contemplating changes that would exacerbate the tax bill’s divide between the rich and the middle class. As for all those “real” working class Americans who support Trump, I’m sure they love it, too ;-). Since minorities are less likely to be wealthy than white people, they can be happy that it suits their ethnocentric nationalism. Adam Serwer’s long essay on race, history, and how we got here with Donald Trump is really, really good. I think it goes a little far in arguing that the media was all “economic anxiety!” as I did read plenty of coverage of what social science has definitively revealed (and Serwer nicely summarizes), i.e., it’s racism (or, racial resentment, as I like to say), stupid. Anyway, so much good stuff in here. Do read it when you get a chance. So many times I’ve been to zoos and the like and if they had wolves, they were always lying, sleeping at the far end of their enclosure. Never had a good look at a wolf. This past weekend, the wolves were up and about at the Western North Carolina Nature Center and it was amazing. Came right up to the glass and looked right at us. So, so cool. or several decades, a consensus has grown that reining in the United States’ $3.2 trillion annual medical bill begins with changing the way doctors are paid: Instead of compensating them for every appointment, service and procedure, they should be paid based on the quality of their care. The efforts to chip away at mandatory payment programs have attracted far less attention than attempts by President Trump and congressional Republicans to dismantle the Affordable Care Act, but they have the potential to affect far more people, because private insurers tend to follow what Medicare does. That in turn affects the country’s ability to deal with soaring health care costs that have pushed up insurance premiums and deductibles. The administration has proposed canceling or shrinking Medicare initiatives that required doctors to accept lump sums for cardiac care and joint replacements, two of Medicare’s biggest cost drivers. Ugh. And all the storm and bluster aside, this is about doctors (and hospitals) getting rich (er). I wanted to take today’s VoxCare to tell you about a Reinhardt paper I think anyone interested in health policy ought to read. It fundamentally shaped how I think about the biggest problems in American health care — and the right solutions to fix them. The paper is called “It’s the prices, stupid!” It is co-authored with Gerald Anderson, Peter Hussey, and Varduhi Petrosyan. The thrust of the argument is this: America does not have an overuse problem when it comes to medicine. We do not go to the doctor more than people in other countries — we actually go to the doctor a little bit less. The reason that American health care is so expensive is that, each time Americans do go to the doctor, we pay outlandishly high prices. We’re not consuming lots and lots of health care. We’re just paying higher price tags. What Uwe Reinhardt taught me about American health care is exactly the title of his paper: It’s the prices, stupid. And that has shaped what I decide to report on. It is why I tackle projects that try to bring more transparency to American health care pricing, and the reason I think it’s important to tell the stories of the medical bills my readers send me. There’s so much wrong with our health care system, but we actually know what the right steps to take are. The ACA was a few baby steps in the right direction. Alas, Trump’s minions (I’m 100% sure Trump himself is beyond clueless on the policy details) want to lead us in precisely the wrong direction. The strongest argument against allowing that choice is that one student’s use of a laptop harms the learning of students around them. In a series of lab experiments, researchers at York University and McMaster University in Canada tested the effect of laptops on students who weren’t using them. Some students were told to perform small tasks on their laptops unrelated to the lecture, like looking up movie times. As expected, these students retained less of the lecture material. But what is really interesting is that the learning of students seated near the laptop users was also negatively affected. I think there are probably narrow, specific, uses where laptops can enhance a classroom. But as for a general purpose tool for note-taking, they clearly need to go.